SUBHEAD: An inconvenient fact is they mostly use oil, gas and coal to get recharged and also have exotic batteries to be replaced. 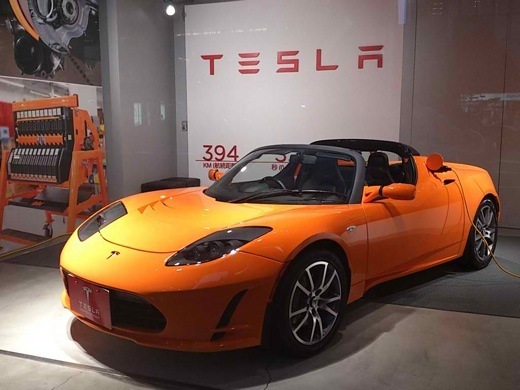 Image above: A Tesla two-seat sports roadster is displayed while it charges at an auto show. From (http://unitedcarsnow.com/2017-tesla-roadster/2017-tesla-roadster-interior/). For all the funds out there looking to fill their portfolio with "environmentally conscious" companies working diligently to avert an inevitable global warming catastrophe that will result in the extinction of the human race, we guess in lieu of their actual fiduciary duties to simply make money for their investors, Morgan Stanley has compiled a list of how you can get the most 'environmental healing' per dollar invested. As MarketWatch points out, it's not terribly surprising that of the 39 publicly-traded stocks analyzed, the solar and wind generation companies landed at the very top of Morgan Stanley's environmentally friendly the list. Not surprisingly, alternative-energy companies ranked the highest in terms of their positive impact, and the “top five climate-change impact stocks” were all manufacturers of solar and wind energy: Canadian Solar, China High Speed Transmission, GCL-Poly, Daqo New Energy, and Jinko Solar. What is surprising, however, is that publicly traded electric car manufacturers, darlings of the environmentally-conscious Left, were actually found to generate more CO2 than they save. As a stark reminder to our left-leaning political elites who created these companies with massive taxpayer funded subsidies, Morgan Stanley points out that while Teslas don't burn gasoline they do have to be charged using electricity generated by coal and other fossil fuels. This is where Tesla, along with China’s Guoxuan High-Tech fall short. “Whilst the electric vehicles and lithium batteries manufactured by these two companies do indeed help to reduce direct CO2 emissions from vehicles, electricity is needed to power them,” Morgan Stanley wrote. Morgan Stanley calculated that an investment of $1 million in Canadian Solar results in nearly 15,300 metric tons of carbon dioxide being saved every year. For Tesla, such an investment adds nearly one-third of a metric ton of CO2.